What Are My Tile Supply Program Options? A manufacturer’s supply program that is supplied through manufacturer-owned locations (such as service centers or showrooms). See option 1 below. A manufacturer’s supply program that is supplied through a regional distributor network. See option 2 below. A distributor’s supply program. See option 3 below. Tile manufacturers, by definition, are experts at making product. 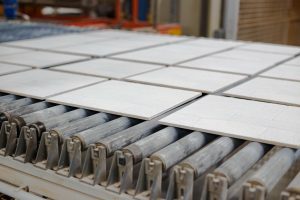 However, a brand needs more than just great product to create an effective tile supply program. Tile manufacturers have a business incentive to create products as efficiently as possible. They are, after all, focused on driving ROI just like all good business people. For a tile manufacturer, doing this well means producing tile efficiently and selling as much of it as possible into all market segments. A manufacturer’s product offering will be driven by manufacturing capability (punch, size, glazes, etc. ), and will be carefully developed to have a balance between aesthetic options and ensuring manufacturing volume to drive cost efficiencies. It is much more efficient to produce the same tile in massive quantities than to stop all production and manufacture a different tile. Downtime is extremely costly in the world of tile manufacturing. The natural result is that often times a manufacturer’s product catalog does not provide a corporate brand enough aesthetic options to consolidate to a single source without sacrificing original design intent. On the surface, the obvious benefit of utilizing a vast network of manufacturer-owned locations is the size of the network. However, building the most effective supply program isn’t about brute force, but rather strategic optimization. While having a vast network of physical locations may seem to offer a service benefit, often times, many of those manufacturer locations will not have the exact items and quantities of stock available for each specific program. The result is that a corporate brand does not in practice get the benefit of a large network of locations because many of those locations don’t have product stock. This will lead to longer lead times between order placement and delivery. In addition, a brand will often feel the cost impact of those many locations in their product pricing. Manufacturer locations carry meaningful overhead costs which must be built into the pricing of their product offering. The result is a brick-and-mortar network that adds cost vis-à-vis additional overhead that is unnecessary for a brand roll-out program without offering actual service advantages. It’s the e-commerce vs. brick-and-mortar retail business models. Corporate brands understand where the future is trending. Quoting, ordering and inventory management are all handled at the individual manufacturer-owned locations across the country. By having each location responsible for elements of a national supply program, the program lacks the centralized consistency and oversight necessary for effective execution. Even if one employee in a central location is assigned to “manage” the account, centralized account management cannot truly be achieved in this model because all orders must eventually flow through the service centers which are still responsible for bringing in stock and coordinating product pick-up. Tile manufacturers who choose to sell through a network of regional distributors have programs that operate similarly to Option 1 above. These programs have the same product development efficiency motivations as found in Option 1 above. Business incentives balance aesthetic options and manufacturing volume to drive cost efficiencies. The result is limitations in product selection. In this model, each distributor is its own separate entity with independent accountability for profitability. This leads these types of supply programs to have cost inconsistency nationwide. In addition, the independence of the distribution network fragments accountability for supply of the program. There is no centralized point to ensure that effective stock levels are being produced at the factory and then re-positioned to optimized geographical supply points based on the brand’s development schedule. This can lead to frequent stock-outs or long lead times with excessive freight costs. The design of the supply chain does not allow for centralized program management. 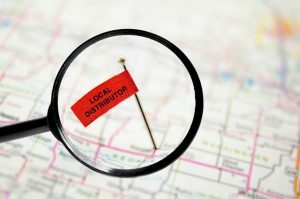 Distributors are typically focused on assisting manufacturers to maintain local supply of product in a defined geography. Distributors do not have a business reason to build a nationwide supply network as their business is typically geographically defined. A distributor’s supply program often operates as described below. Product lines are purchased and stocked in the distributor’s regional warehouse. Accordingly, while distributors will carry products from multiple manufacturers, they are incentivized to have the products they stock specified on corporate brand programs. In addition, they often do not purchase dedicated production line time to drive the needed cost efficiencies for a multi-unit corporate program. All products are supplied out of one (or a few) geographically limited warehouses. For projects needing materials that are in the distributor’s territory, freight costs are reasonable. However, for any projects that are not proximate to the distributor, freight costs are excessive. The weakness of these programs is often the significant freight cost that naturally result from a non-optimized warehouse network that lacks national reach. The secondary weakness of this is longer lead-times. Typically, distributors are primarily focused on servicing a dealer network which facilitates supply to the residential channel. Accordingly, most distributors do not dedicate independent program management personnel toward inventory planning, order management, take-off assistance, design services and job site quality control. The result is a limited amount of program services. Learn how a Creative Materials’ Consolidated Tile Supply Program combines and optimizes the best pieces of each of the three options above into the best option of all.